Submission period ends February 18th at 11:59 PM CST. Good luck everyone! 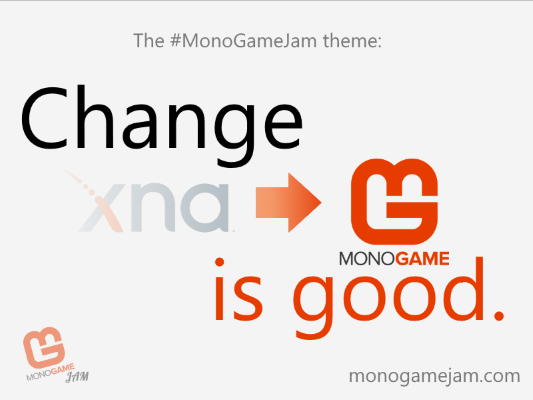 MonoGameJam is a game jam for to those who love MonoGame! Build a game using MonoGame http://www.monogame.net/ in a week and share it with the world! The game must be built using MonoGame. *See FAQ below for more details. The game must be created during the event time frame. You may not submit games created prior to the event. Only publicly available frameworks and engines may be used. You may use your own libraries, but they must be declared and licensed available for others to use for personal and commercial use. Please declare any personal frameworks you want to use in the Community area and let others know how they to may use it. The best way to ensure compliance is to post the source code to GitHub, or another public repo, under a permissive license (e.g. MIT). **See FAQ below for more details. Assets (graphics, music, etc) created prior to the event window may be used so long as you have the legal right to use and distribute them, and they adhere to all Itch.io policies around asset usage and distribution. The jam may be done solo or in teams. Overall, overall how good is this game? Originality, how original is the art, music, story, gameplay? Graphics, how great were the graphics? Audio, how good was the audio? Story, was the story engaging? Controls, how fluid were the controls? Theme, how well does the game capture the theme? [TBD] is there something missing? Let me know! Q) When does the jam start and when does it end? A) Submission open from Saturday February 10 at 09:00 PM CST to February 18th 2018 at 11:59 PM CST. The theme will be announced as soon as the submissions are open. A) Sign up using an itch.io account. Q) Will I be disqualified if I am too late, even 15 minutes or even 5 minutes? Will there be a grace period? A) There will not be a grace period. You have one week to finish. Exceptions will be made on a case by case basis. Q) Do I need to release my source code? A) Yes. The game code must be open so others may learn from it. However, there are no license requirements. Q) *Do I absolutely need to use MonoGame? I'm so used to XNA or FNA, can I use XNA or FNA instead because they are all siblings? I mean, I don't plan to use Unity or anything unrelated, I just think XNA or FNA would fit my needs a lot better. A) FNA is okay as long as what you're writing is compatible with MonoGame. XNA is dead, let it go. Q) Can I use only C# or is it okay if I use another .NET language like F# or VB.Net? A) Any language having the capability to use a MonoGame assembly may be used. Q) Can I win prizes? A) No. Unless a sponsor comes forward. A) Do I need to release my game on itch.io? What do I need to release the source code? A .exe package? Do I need to provide an installer? Q) Yes. Games must be submitted through itch.io. You can bundle your game's executables with it's source code in a zip. Q) How exactly do I submit my completed jam game? Is there a short manual or anything I could follow along? Q) Can I form a team with other people? A) Yes. You can form a team with however many people that you want. Q) I cannot code and I have never tried to code. Can I still participate? A) Yes. However, MonoGame relies on code and there is no visual editor you can use, and so it may be difficult to get started. That being said, don't let us tell you what you are capable of. If this sounds fun then give it a try! Alternatively, you can join a team. Q) I can code, I even know some C#. But I haven't ever touched XNA, Monogame nor FNA. Can I still participate? A) Yes. Game jams are an excellent opportunity to learn new technologies! Q) I read a lot about success games like Stardew Valley made with MonoGame. It's on Switch now. Will you help me release my jam game on Nintendo's Switch console? Q) Will you help promote my jam game with a Tweet or two, maybe a blog article? A) No, but people tend to share games they fall in love with. Make something awesome and I'm sure other participants will share! 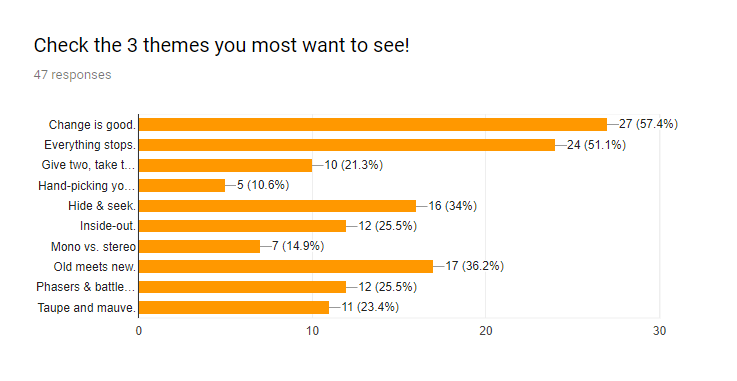 Q) Can I make a NSFW game? A) Entries must adhere to any of Itch.io's content policies (assuming they have them). If they are okay with it then feel free to submit, but please be courteous to others and disclose it as such. A) A lot of options may be found here: http://community.monogame.net/t/useful-monogame-related-links-u-mg-rl/8573/19 GameFromScrach also has a series here: http://www.gamefromscratch.com/page/MonoGame-Tutorial-Series.aspx and some YouTube videos as well When it doubt, just google it! Q) How many "hours" (or minutes) of gameplay should I aim for? Are 30 minutes ok? 10 minutes? 5 hours? A) There is no limitations or expectations for game length, build whatever you want! Q) Does my game need to be compatible with targets like... Windows 7 / 8.1 / 10, MacOS, ...? A) No. Feel free to submit executable for any platforms you are able to. Q) **I am writing my own engine/framework but don't want to open source it for this jam, may I still use it? A) Yes, but you must make binaries available to any participant of the jam who would like to use it for their entry. Tower Defense game where you need to be good. My entry for the MonoGameJam: A puzzle game with colors and a rabbit! When the world stopped, a researcher found his way in the center of the planet. ​Escape a shattered star system by scavenging metals from destroyed interstellar vessels to repair your own. Collect fruit to change size and color!